OMAHA, Neb. 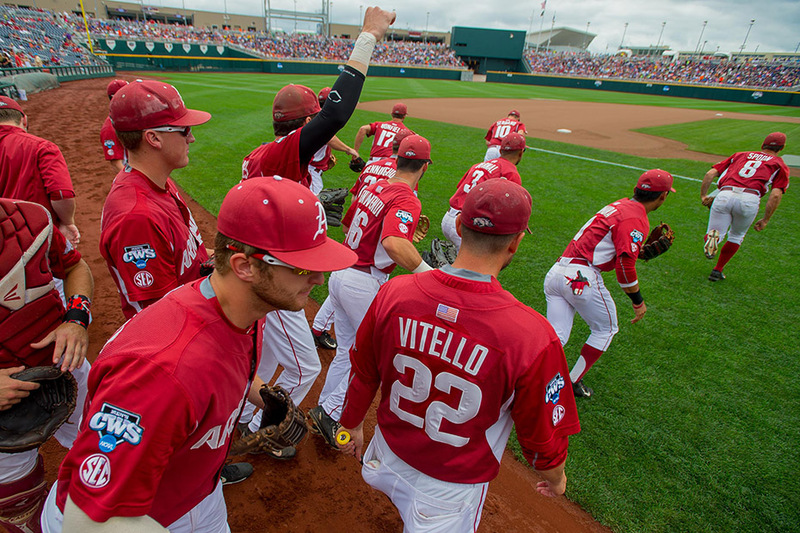 – The University of Arkansas baseball team will look to keep its National Championship hopes alive Monday afternoon, taking on Miami at 4:15 p.m. at TD Ameritrade Park in the College World Series. The game will begin 55 minutes after the conclusion of the Vanderbilt and Cal State Fullerton game, which is set to resume at 2 p.m. with three innings left to play. When: Monday, June 15 – 2:05 p.m.
Series Note: Arkansas is 0-4 all-time against the Hurricanes, dropping a three-game series in Coral Gables in 1985, before falling to Miami at a neutral site in 2001. Coach Van Horn has never faced Miami in his 21 years as a Division I head coach. • The Razorbacks are one of just five teams nationally to advance to the NCAA Tournament each of the last 14 years. Arkansas is joined by Cal State Fullerton, Florida State, Miami (Fla.) and Rice as the only programs to accomplish the feat. • Arkansas continues its postseason quest, advancing to the College World Series for the eighth time in program history, making appearances in 1979, 1985, 1987, 1989, 2004, 2009, 2012 and now 2015. • The Razorbacks look to top the program-best National Runner-up finish in 1979. Since the title game appearance, Arkansas has never won more than two games during a trip to Omaha. • Arkansas is 71-60 all-time in the NCAA Tournament, including 17 tournament wins in the last four years. • The Razorbacks are 7-4 in postseason play: 2-2 in the SEC Tournament, 3-0 in the Stillwater Regional, 2-1 in the Fayetteville Super Regional and 0-1 in the World Series. • The Razorbacks are 11-15 all-time in the College World Series and 4-4 in CWS openers after Saturday’s loss to Virginia. • Over his 13 seasons at Arkansas, DVH has led the Razorbacks to four College World Series appearances, five Super Regionals, 13 NCAA Tournament berths, one Southeastern Conference overall title, three SEC Western Division championships and a total of 524 wins, averaging more than 40 wins per season. • Hit his nation-leading 20th home run of the year in the fifth inning against Virginia. • Is the first player in program history with 20 home and 20 stolen bases in a season. • Is the fifth player in program history to hit 20 or more home runs in a season. • Is the first NCAA Division I player since Western Kentucky’s Wade Gaynor in 2009 to hit 20 home runs and steal 20 bases in a season. Andrew Benintendi is on the brink of becoming the third player in SEC history to lead the league in home runs and batting average, currently holding a two-homer lead and six-point edge in batting average. He would join Rafael Palmeiro (Miss State in ‘84) and Jeff Abbott (UK in ‘94) as the only players in conference history to accomplish the feat.